Easter tableware adds color and cheer to each table. We have everything you need to make Easter Sunday a complete success! The tableware you select for Easter dinner will be the first thing all of your family and friends notice so make sure to make a great first impression. Try out our Easter eggs table runner to add some extra decorative flair to the dinner table. You could also utilize some of our pink cutlery to put a festive twist on traditional Easter tableware! Struggling to think of some great Easter tableware ideas? Browse our website and in minutes you’ll be filled with great new ideas like our grass table cover! Don’t forget to ask about bulk discounts on select items on our website! No matter what kind of Easter tableware or Easter party decorations you are in need of we have got you covered! We’re PartyCheap.com and we know how to party! Decorate your table with the soft pastel colors of our Easter Tableware. We have Easter inspired plates, napkins and cups for your Easter parties. We offer several tableware sets in lovely pastel colors. 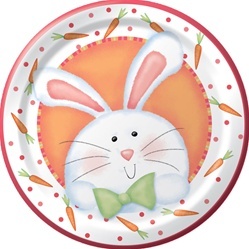 Don't use boring plates to celebrate with your kiddos after the big hunt, use our fun plates! Also check out our Easter table covers and table runner to see what you can add to make your table look great! Don't forget to check out all of our Easter decorations to set up for a great Easter party! mSet up the perfect Easter table with our products! Use our Easter Egg table cover or one of our rectangle or round table covers. Then pick one of our adorable Easter tableware sets: Happy Easter, Easter Bunny, or any of our pastel colored tableware sets. We also have assorted cutlery that you can get to match whatever tableware set you go with. Then make sure to check out all of our Easter centerpieces to display in the center of the table and bring everything together! No matter what kind of Easter tableware or party supplies you are looking for we’ve got you covered! We’re PartyCheap.com and we know how to party!